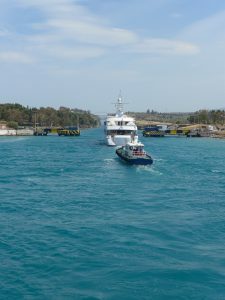 The mainland Greece port of Piraeus is just 15km from Athens city centre. It is a huge port with two terminals as it handles a lot of cruises and local cruise ferries. An immense amount of international cargo to the European Union passes through it each year. Among a large number of ships docked alongside us, I was rather excited to see Carnival Vista just front-left of us, with a Norwegian Cruise Line ship in between – such is cruise geekdom! 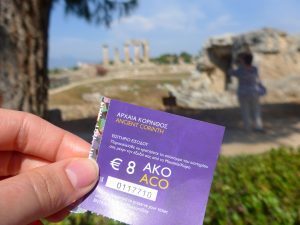 Royal Caribbean offered a selection of tours for Athens plus a shuttle service for those wanting to see the Greek capital city on their own. But we had decided to skip Athens for something more quaint and with a lot less traffic & less queueing. 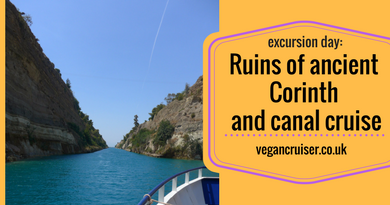 Instead, we chose a half-day guided tour visit to Ancient Corinth with a Corinth canal cruise. Our journey from the port took us about an hour and 15 minutes out of Athens, along a coastal motorway. 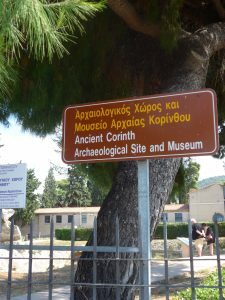 Corinth is probably known to most of us because of its Biblical reference. 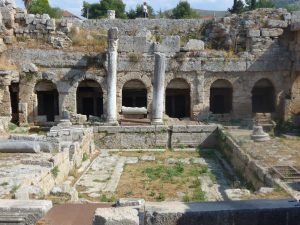 The apostle Paul’s two letters to the church in Corinth and his time spent there. As an ancient city is it much older, with first traces of inhabitation being from around 6000BC (as per archeological finds- see Wiki). In 400BC Corinth already had over 90,000 citizens and was one of the main cities of importance in then Greece. Our full busload of travellers were first driven to the canal photo-op point, a small car park with a tourist service station (read: souvenir shop, cafe & toilets). From the car park there is pedestrian access to the bridge crossing the canal. The bridge offers a great vantage point to the canal underneath, the narrow rocky walls and long drop below. A simple, but such stunning view. The canal itself was a brainchild of Emperor Nero who started the project in the first century. The build wasn’t completed until the 1890s though, after both French and Hungarian teams consequently failed to finish the work. A third and final push by Greek builders completed the task in 1893. 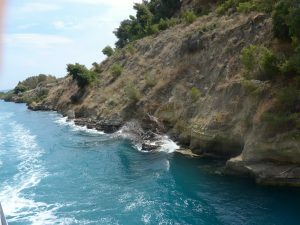 Its formation turned the large Peloponnesian peninsula of Greece into an island. Being narrow (approx 21m wide), the canal cannot be used for modern large shipping. Instead it mostly serves local leisure traffic and tourists like us. Some smaller cruise ships are able to pass as well. 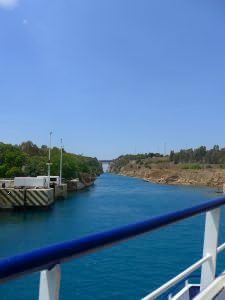 After the bridge photo-op, we were driven down to Isthmia where we boarded a local boat, Argo, for our sailing. Stepping onto our tour boat we were handed a poker chip – its purpose to be revealed a little later. Most of us made our way to the top deck to get height and best views over the canal while enjoying the late May sunshine (temperatures were about 27 degrees celsius that day). During our sailing along the 6km canal our tour guide got to rest and an audio tape describing the canal and its build/history was played. Later we were invited to the lower deck where a traditional mezze lunch was served. I hadn’t mentioned the fact I am vegan when we booked our excursion, as I had totally forgotten we would get food on a half-day trip. 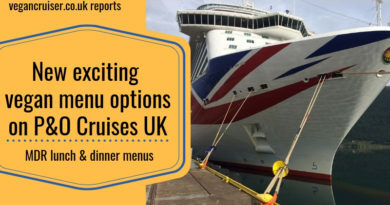 With hindsight, since catering is done by a 3rd party tour provider, I’m not sure if a dietary request made onboard would have made it to the tour company. Instead that morning, I did like many of us vegans do – mentally prepared myself for a plate of salad leaves/garnish. I had smuggled a banana from the ship in my bag, just in case. But thankfully, and possibly for cost purposes, most items served that afternoon for lunch were vegan! Roast potato slices with herbs, a selection of olives, rice & herb filled dolmades (vine leaves), tomatoes and cucumber. There may have been some seafood, I have almost managed to block that from my mind. With the chip we were given upon stepping onboard we were able to get a soft drink from the bar, a glass of wine or ouzo. Considering it was a hot afternoon and we still had the ancient Corinth to visit I figured it was best to stay off spirits and the cheap (possibly non-vegan) wine. Sensibly, I opted for a can of Coke Light. After our canal tour we climbed back onto the bus and had a short ride to ancient Corinth and the on-site archeological museum. The site is small, as is the museum so do not book this excursion hoping for historical remains as extensive as Pompei or even Ephesus in Turkey. Corinth was definitely the smallest of those mentioned and had least amount of visible excavation. But a successful visit regardless as we had a very interesting tour with an enthusiastic and knowledgeable tour guide – so passionate about the history, customs and the ancient civilisation that resided on the site. And much like every other cruise ship tour, ours ended with a guided shopping opportunity. Our tour guide lead us into a local gift shop that sold hand-painted pottery (live demonstrations in store) and religious icons. Soon it was time to head back on our bus. Considering the light lunch served onboard Argo I’m sure we were all ready for a proper dinner – my friend and I certainly were. As soon as we got back onboard we reserved our table for early dining. The weather was wonderfully warm on this May day. We got to sail a canal. We got to walk around ruins steeped deep in Biblical history. I even had vegan options on the excursion buffet lunch – not a bad day! I would definitely recommend this Royal Caribbean tour for others calling at Piraeus port with them! 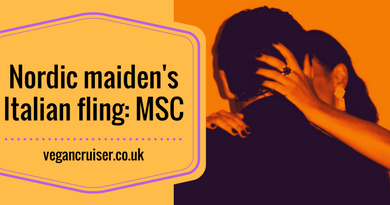 Please don’t hesitate to ask a question or leave a comment – would love to hear from you all! 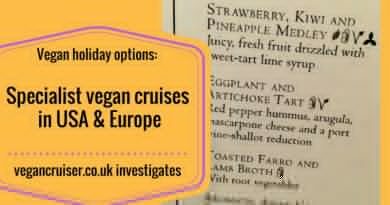 Brand new P&O vegan menu is here!